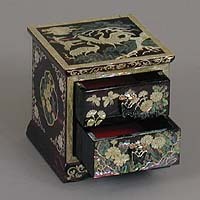 Two Drawer Purple Cranes and Rice-paper jewelry box shown at right. We also have ten new styles of business card cases for the Christmas season that depict scenes from Korean folklore and are believed to bring fortune or health to the bearer. See all our new items here. Dolls make great gifts for children and adults alike at Christmas and we have three of our favorites on sale. Additionally we have three different styles of desktop business car cases that add an elegant touch to your office. No-ri-gae (shown at right) are traditional Korean decorations hung on cabinets or door handles to liven them up, and are also used as clothing accessories on traditional Korean Han-bok clothing. For a touch of Korea at Christmas they also make great Christmas tree decorations. See all our dolls. Desktop business card cases, No-ri-gae and other sale items here. Although Korea is about one third Christian, it does not have a long Christian history, and as such, Christmas here is a little different than in the West. As in the West, Christmas tends to be more commercial than religious and so starting in mid-November many of the large shops and department stores in Seoul put up their holiday lights. Christmas trees start to appear near the end of November in plazas, hotel lobbies and department stores and many homes have small artificial trees but they are not usually set-up until a week or so before Christmas. 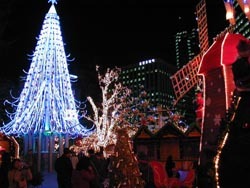 With all the lights, Seoul at night is a really beautiful city, and there is a real feeling of holiday cheer. There are even street vendors selling chestnuts roasted over open fires. Actually they sell those all winter long, and they taste great on a cold wintry day. The big holidays in Korea are Chuseok, which is the Korean Thanksgiving and is based on the lunar calendar so its date changes every year in relation to the solar calendar (the calendar used in the West). This year it was on September 22. The other big holiday is New Year�s Day (Seol-nal). Koreans do celebrate the solar calendar based New Year�s Day (January 1), but the big holiday is the Lunar New Year which is the first day of the new moon and is based on the lunar calendar, so it changes on the solar calendar each year too just like Chuseok. In 2011 it is on Februrary 3. For Chuseok and the Lunar New Year Korean families brave gridlock traffic to travel to their hometowns and gather with their families for three days. Compared to those holidays, Christmas is not such a big event to most Korean families. Families as a group usually don�t do anything special, but younger people, do take advantage of the romantic feeling of the season and all the beautiful lights, and frequently exchange gifts and meet with friends or lovers to enjoy a night out on the town on Christmas day. Please plan ahead. Our deadline for Christmas gifts via Standard shipping is December 9, and December 16 for Express shipping (Korea time). Although Standard/Express shipping times are generally 7-12 and 3-5 days, respectively, to North America, and a few days more to Europe, there may be some delays due to the Christmas rush. Please plan ahead and order early. We cannot promise orders received after these dates will arrive by Christmas. See more details here. Email exchanges are becoming increasingly unreliable due to the various efforts to thwart unsolicited mail. If you would like to ensure delivery of our messages to you, we recommend you add our domain � Korean-Arts.com - to your list of acceptable correspondents.